I am trying to learn R and want to bring in an SPSS file, which I can open in SPSS. I have tried using read.spss from foreign and spss.get from Hmisc. Both error messages are the same. Also, I tried saving out the SPSS file as a SPSS 7 .sav file (was previously using SPSS 18). The importer mechanism is more flexible and extensible than read.spss and read.dta of package "foreign", as most of the parsing of the file headers is done in R. They are also adapted to load efficiently large data sets. Most importantly, importer objects support the labels, missing.values, and descriptions, provided by this package. The read.spss seems to be outdated a little bit, so I used package called memisc. The good news is that PSPP 0.6.1 should read the files fine, as long as you specify a "String Width" of "Short - 255 (SPSS 12.0 and earlier)" on the "Download Data" page in Qualtrics. Read it into PSPP, save a new copy, and you should be in business. Awkward, but free. It looks like the R read.spss implementation is incomplete or broken. R2.10.1 does better than R2.8.1, however. It appears that R gets upset about custom attributes in a sav file even with 2.10.1 (The latest I have). R also may not understand the character encoding field in the file, and in particular it probably does not work with SPSS Unicode files. If so, delete them (see VARIABLE ATTRIBUTE and DATAFILE ATTRIBUTE commands), and try again. You can read SPSS file from R using above solutions or the one you are currently using. Just make sure that the command is fed with the file, that it can read properly. I had same error and the problem was, SPSS could not access that file. You should make sure the file path is correct, file is accessible and it is in correct format. As far as warning message is concerned, It does not affect the data. The record type 7 is used to store features in newer SPSS software to make older SPSS software able to read new data. But does not affect data. I have used this numerous times and data is not lost. Can you provide some info on SPSS/R/Hmisc/foreign version? IBM SPSS Statistics Data File Driver. Standalone driver is enough. 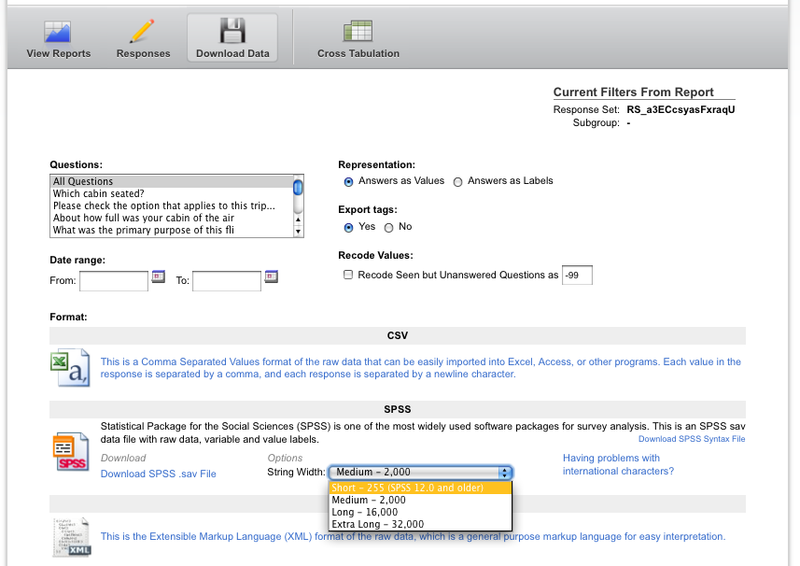 Import SPSS data using RODBC package in R.
See the example here. However I have to admit that, there could be problems with very big data files. For me it works well using memisc! There is no such problem with packages you are using. The only requirement for read a spss file is to put the file into a PORTABLE format file. I mean, spss file have *.sav extension. You need to transform your spss file in a portable document that uses *.por extension. Hope the above code will help someone else. I agree with @SDahm that the haven package would be the way to go. I myself have struggled a bit with string values when starting to use it, so I thought I'd share my approach on that here, too. The "semantics" vignette has some useful information on this topic. I've found the program, stat-transfer, useful for importing spss and stata files into R.
It resolves the issue you mention by converting spss to R dataset. Also very useful for subsetting super large datasets into smaller portions consumable by R. Not free, but a very useful tool for working with datasets from different programs -- especially if you don't have access to them. Memisc package also has an spss function worth trying.